Operating from a small kitchen, they have their presence felt in 14 cities now. Starting off in a 50 square feet outlet, the business has developed into a large factory today. CEO Musthafa PC says they wish to be a unicorn in the next five years. Musthafa grew up in a village Chennalode in Kerala that never saw electricity. After studying hard, he graduated in engineering and landed up with a corporate job. He had stayed in the Middle East and UK for job reasons. Musthafa and his cousins had set up a local grocery store in Bangalore. They noticed that Dosa and Idly batter was being served in loose plastic bags. The fact that batter was sold in plastic bags didn’t quite seem impressive to Musthafa. After a vivid thought, the cousins decided to do something similar in a hygienic way. They started off in a small kitchen with a single grinder and manufactured around 100 packets of batter. Gradually, it transferred into a larger one and finally a large factory was formed. A meagre investment of INR. 50,000, his company has seen a turnover of INR. 150 crore in the last financial year. When asked about the positioning of his brand after five years down the line, a confident Musthafa says iD would definitely be a unicorn till then. Successful Musthafa asks budding entrepreneurs to use common sense as their weapon and identify the problems and provide a real time solution to it. 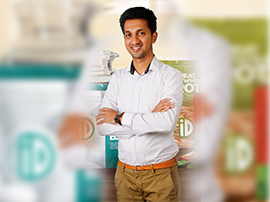 iD foods plan to enter the global shores soon. Big ideas are indeed born when one solves everyday problems. Stay connected with us for more such inspiring stories.